Eel (igat, palos) culture can be done with a minimum investment, using locally available and cheap resources. The system of raising eels cal also be made environment-friendly. Eels are long snake-like fishes with a smooth slimy scaleless skin. There are thousands of this kind in the sea and hundreds in freshwater. Monopterus albus (ricefield eel), which became instinct for unknown reasons was introduced by the International Institute of Rural Reconstruction (IIRR) in the late 80’s. Many farmers are raising this species for food. its natural food are fish, snails, aquatic insects, invertebrates, worms, etc. 2. 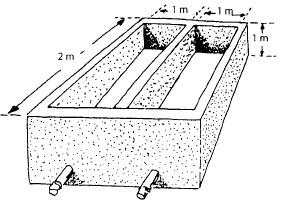 Construct twin tanks 1M x 2M x 1M in size with a total surface area of 4 sqm. The tank should be leak-proof with an outlet at the bottom. the third is comprised of finely-chopped banana trunks which are cut a week prior to introduction and must be 10cm thick. This layering is good only for Monopterus eels. Aguillan, the local variety found in the rivers in Cagayan (Aparri) and Mindanao (Cotabato), can be raised using the same strategy, but the tanks should not have mud. 4. 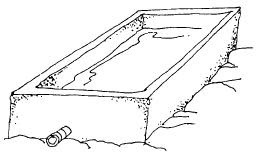 Introduce water into the tank, 15 cm above the top layer. 5. Allow the materials to decompose for about a week. This is apparent with the production of a foam. 6. Drain the water out and introduce fresh water again. Repeat this process every week for 20-25 days until no more froth appears. 7. Introduce tilapia or carp fingerlings to check if the tank is ready for culturing eels. 8. Allow the fingerlings to stay inside the tank for three days, if they do not die, that means the tank is ready for the introduction of eels. The tank, which is ready, will have a similar quality to a ricefield. 9. Before the introduction of eels, plant aquatic plants such as water hyacinth or kangkong on the top soil. The plants will provide shelter for the eels from direct sunlight and also act as a hiding place. 10. For the tank size mentioned, introduce 195 to 200 eels with a ratio of 140 females and 60 males.